This sweet picture book by Glenys Nellist and illustrated by Rachel Clowes features the stories of fourteen women and girls from the Bible. 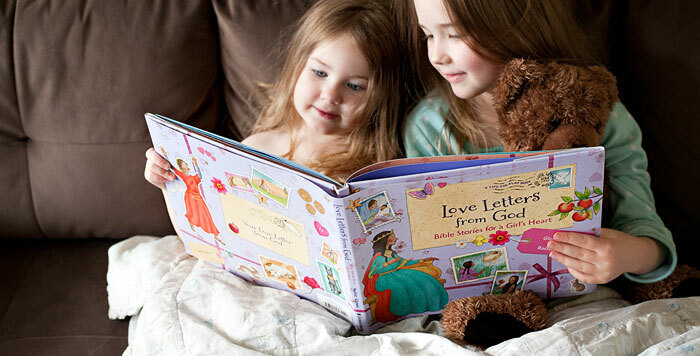 Each story includes a lift-the-flap envelope with a special “Love Letter from God” offering a heart-warming message that turns the key themes of the story into a personal message for your girl. Intended as a read-aloud to girls ages four and up, the personal messages even include a fill-in-the-blank spot where you can say the name of the girl you’re reading the story to, so it can feel extra-special to her. I love the way this book highlights the fact that girls are important to God, and their stories are in the Bible, too. I think it can be easy for girls to always just hear the stories in Sunday School about famous boys from the Bible like David, Joseph, Moses, Abraham, etc. and feel like there’s not really a place for girls in God’s story. This book helps show the importance of unfortunately often overlooked stories like Miriam, Deborah, Hannah, Naaman’s servant girl, and many more, as well as the well-known ones like Eve, Esther, and Mary. The only thing I’m sad about with this book is that I didn’t have it when my oldest was younger. That said, even though she’s almost ten now I really want her to hear the messages in this beautiful Bible storybook, so I think I’ll have her sit in with us while I read it to her younger sisters. ← After nine years, I finally found a REALLY great nursing pillow! <3 I'm so happy to hear that, Glenys! I will definitely post my review on Amazon as well! Thank you so much for doing that Heather! this looks like a darling book for little girls! Very sweet.